It's not badly done... I just don't know who it's for. A curious item this one. Piledriver came to my attention in issue #77 when I was sent their third album 'Brothers In Boogie' to review. A German five-piece from Essen who began as a Status Quo tribute band, they then started writing their own material, albeit with the express purpose of keeping the classic "Frantic Four" era sound of Quo alive. 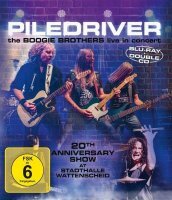 This captures them in concert via a very impressive Blu-ray and double CD set. The filming and lighting is excellent and the sound – mastered by ex-U.D.O. and Accept man Stefan Kaufman – is loud and clear. As for the material itself, the band open their show with 'One Way To Rock' from their most recent album and it translates well live, despite its clear Quo influence. The same goes for 'Good Times' before what I considered the band's best cut, although the one with absolutely the worst title ever – 'Rock You In A Crossfire-Hurricane'. The horrendous lyrical work notwithstanding, it has an excellent riff which shows the group have more up their sleeve than just aping Quo chord sequences. After 'Fat Rat Boogie' and 'Don't Think It Matters', it gets a bit weird as the band completely dispense with their own material and rattle through a series of Quo classics, such as 'Roll Over Lay Down', 'Little Lady', 'Down Down', 'Whatever You Want', 'Don't Waste My Time', 'Rockin' All Over The World' and 'Caroline'. I found the clear distinction between well-worn Rock classics like these and original material attempting to emulate that style glaringly obvious. 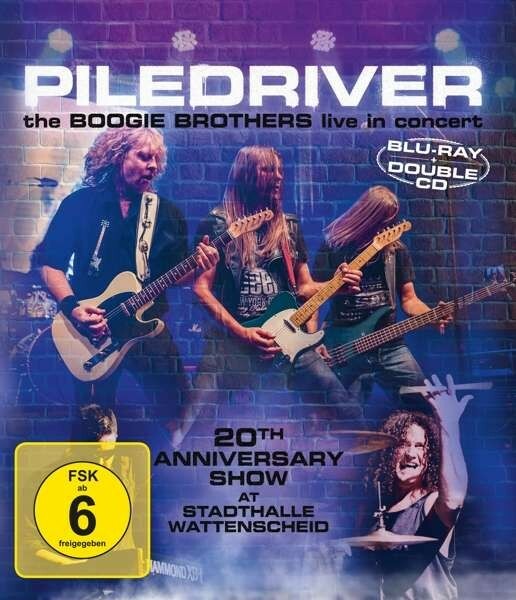 On top of that, guitarist/vocalist Peter Wagner, with his long straight hair and stance, does his best to replicate seventies Francis Rossi, while Michael Sommerhoff could visually be easily mistaken for Rick Parfitt... if I took my contact lenses out. The result is, for the opening eight original songs, you're looking at a band playing songs who look a lot like Quo and sound a bit like Quo. For the subsequent eleven Quo standards... they sound a bit like Quo and look a lot like Quo. Perhaps they didn't feel they had enough strong original material to fill out a full set, or maybe they just really like playing old Quo stuff, but what you end up with is neither an original band nor a tribute, just something in between. It's not badly done... I just don't know who it's for.